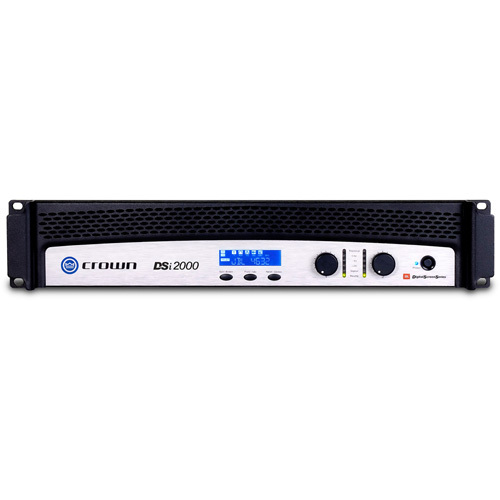 The CDi 2000 from Crown Audio is a rugged, lightweight amplifier designed for installed audio applications. CDi stands for "Contractor Digital Intelligence". The CDi 2000 provides accurate, uncolored sound with low distortion for excellent music and vocal reproduction. It also handles a wide range of speaker impedances and outputs, making it very versatile. Advanced protection circuitry guards against shorted outputs, open circuits, DC, mismatched loads, general overheating, high-frequency overloads and internal faults. The CDi 2000 also has integrated DSP presets for crossover frequencies, EQ, limiting, compression, delay, and a subharmonic synthesizer. A backlit LCD displays relevant information.